Soon users may not need to jailbreak in order to get custom widgets on the iPhone with iOS 5. At least, that’s what a recent patent granted to Apple suggests. The GPS module 135 determines the location of the device and provides this information for use in various applications (e.g., to telephone 138 for use in location-based dialing, to camera 143 and/or blogger 142 as picture/video metadata, and to applications that provide location-based services such as weather widgets, local yellow page widgets, and map/navigation widgets). Other widgets are clearly mentioned, including a calculator, alarm clock, dictionary, and again there are references to “User-Created Widget(s)” and “Widget Creator Module”. That seems to indicate that it may be possible to create custom widgets directly on the iPhone itself, possibly similar to the Safari Web Clip tool that easily creates widgets for the Mac OS X Dashboard. The initial patent was discovered by PatentlyApple, and has since caused a lot of noise on the web for other reasons, but speculation on a patents reach is not what caught my interest. User created widgets in iOS 5 for iPad and iPhone without a jailbreak? Maybe even a widget store in iTunes? It’s just a patent so consider it a rumor, but let’s hope so. More customization is always a good thing. New Patent Looks Like iOS Running Atop Mac OS X as a Dashboard? 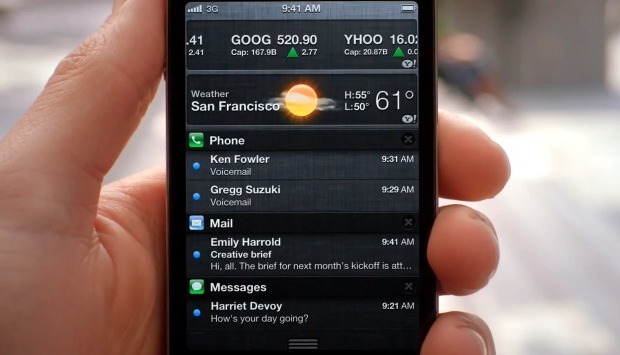 iOS 5 to Bring Revamped Notifications and Widgets? I doubt we’ll see a widget store or even a central repository for them, but there’s probably a fair chance you’ll be able to pin minimal apps to the Notification Center. If this is true, and you want to make a stack of cash, listen closely. I can’t believe that your current day’s appointments don’t appear by default in the notification center. Anyone who uses iCal will clearly feel things have fallen short here. Any way, here’s a chance for someone to sell several million widgets for $0.99ea – start your XCoding!